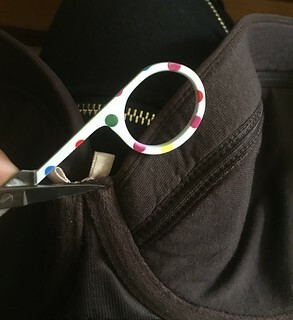 This blog post is going to be about how the fit of a bra changes when you remove the wires. I will be using my Impimi Nicole bra, and the original review for that can be found here. I chose this bra specifically because the wires are extremely painful for me. Literally when I put the bra on this morning the gore was stabbing me. I love the color of this bra, but it’s virtually unwearable with the wires. What I did first was get the sharpest scissors I have and gently go back and forth with one end of the blade, against the wire channel above where the wire is. The wire didn’t slip out easily, so I had to use a little force. As you can see, the wires are definitely in a plunge shape. Once I took the wires out, the cup immediately widened. Left side has wire, right side does not. 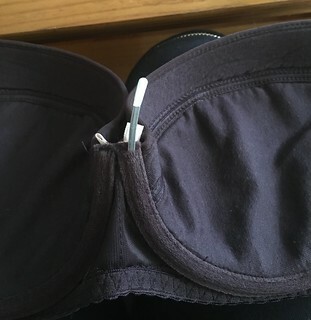 When putting the bra on after removing the wires I immediately felt a difference. For one, it was more comfortable, there was nothing stabbing me. With the wire removed there was nothing holding the cup into place, so on my bigger side the cup kind of collapsed. This bothered me very much. I found myself constantly touching my chest. It felt weird. The cup looks a little lower without the wire. This bra felt somewhat like a padded bralette. I’m not sure if I mentioned this, but I hate bralettes. I don’t know what I’m going to do with this bra. I can’t wear it with the wires, and I don’t like it without the wires. I thought I’d reviewed this a long time ago, but apparently I didn’t. The review is going to be how it currenly fits, not how it fit when I first got it. I believe the Kostar bras are the second set of unlined Polish bras that I ordered ( the first set being from Melissa Dessous). I initially wanted to try this bra, but I didn’t because it looked too much like Freya bras, and those don’t fit my shape. There is a funny thing going on with the cup. The bottom of the cup seems like it doesnt really have enough depth for me. 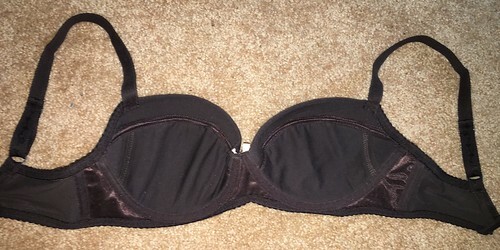 When I first got this bra it seems like the cups were a little too small, but I don’t believe there was any quadding or cutting it, it was just too small. Today, the cups are really small. I bought this bra back in March. There’s a good amount of quadding, so this is definitely too small. 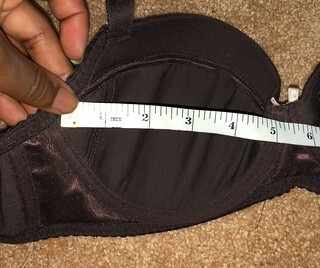 The depth of this bra is only 7.25 inches (18.42 cm) (at least a full inch smaller that what I require in bras), and the width is 4.5 inches (11.43 cm), half an inch smaller than what I require I don’t think I would reorder this in a bigger size, as I think that this bra is best for someone shallow and/or someone that’s more even than I am. Plus, I don’t love it. The height of the up is nice and low, at 5.25 inches (13.34 cm). I love how thin the straps are. I wish all bras (in my size) had straps this thin. They’re a hair under half an inch, and very reminiscent to the straps on VS bras. I miss thin straps. Most DD+ bras have traps that are really thick, even in the smaller sizes. Although I love the thinness of the straps, they are very stretchy and elastic. Stretchy to the point where its annoying and they feel tight. With adjusting they’r either too tight or too loose, there’s no in between. The band is firm. It stretches to 27.5 inches (69.85 cm). (I don’t know why the straps are adjusted to an uneven amount, so excuse the lopsided band). The wings are nice and low, at 3.1 inches (7.87 cm). I think the gore is a little too high for my tastes, even though it’s 2.5 inches (6.35 cm) high. It’s also .75 inches (1.91 cm) wide. I didn’t have the bra on long enough to say whether or not it would be pokey. You can can read my post on how to order fro Kostar here.